Questionnaire: Do You Have Grounds to Fight Your Parking Ticket? Home > Common Complaints > Questionnaire: Do You Have Grounds to Fight Your Parking Ticket? If you have been issued with a parking ticket and think it is unfair, you need to write to the ticket issuer detailing the grounds as to why the ticket has been unfairly issued and any supporting evidence. This questionnaire aims to help you discover if you have adequate grounds to appeal. 1)	Was the ticket a Public Charge Notice issued by the council or local authority or by the Transport for London Authority? 2)	Have you been issued with a Fixed Penalty Notice from the police? 3)	Was the charge issued whilst parked on private land, a supermarket or train station car park? 4)	Have you left the invoice unpaid? 5)	Did you believe you were able to park there? 6)	If so, do you have reason to believe that they have got it wrong and you were actually parked correctly? 7)	Was it difficult to see signage for parking because it was too small, hidden, or ambiguous? 8)	Were you parked correctly in marked bays? 10)	Have you checked to see if you have been overcharged? 11)	Did the council add a new restriction without following proper procedures? 12)	Was someone else the owner of the vehicle when the contravention occurred? 13)	Was the vehicle stolen at the time of the contravention? 14)	Was the vehicle used without your permission at the time? 15)	Have you already paid the charge at the correct time? 16)	Do you agree that you parked illegally/incorrectly? 17)	Is the Notice you have received fully complete and correct? 18)	Were there any emergencies or mitigating circumstances as to why you parked there? 19)	Would paying a fine cause financial hardship? 20)	Is the fine disproportionate to the breach? Questions 1 to 3 aim to help you to find out who issued the parking ticket. If your ticket was issued by the council or London Transport Authority, then you have been issued with a civil public ticket. 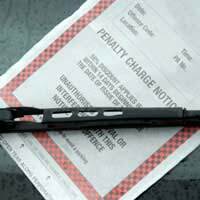 If you answered yes to a Fixed Penalty Notice from the Police, then you have been issued with a public parking ticket under the criminal rules. If however, you answered yes to a ticket issued on private land, then you have been given a private parking ticket. A private parking ticket is not an official ticket, but a ‘breach of contract’ with the company. It is important to know who issued the ticket because there are different rules and grounds to appeal depending on the type of ticket. Question 4 is a very important factor. If you have already paid the ‘fine’ and wish for a refund, then you are very unlikely to win your case as paying is seen as admitting liability. You should not pay if you plan to appeal but you must act quickly as most fines will increase. Questions 5 to 11 are part of the most common ground to appeal a parking ticket; the contravention did not occur. If you truly believed that you were able to park there, for example, there were no clear signs or markings were faded and you have photographic proof then you have very strong grounds to fight your case. Questions 12 to 15 deal with the situation where, for example if you had sold the car the week prior to the offence or breach or if the car was stolen at the time. If you can prove the sale or that you reported the theft of the car, you have extremely strong grounds to win. If someone else was driving the car without your permission, it is more difficult to prove but you can ask to see if the ticket issuer has any evidence of the driver. If you have already paid the charge, simply show bank statements or telephone statements to prove you called the pay line. These questions are only if you admit to the offence but have good reason to appeal. If you can prove there was an emergency, you have a good chance of fighting the ticket. It is harder to appeal when admitting the offence though worth trying if you will struggle to pay. This is a ‘catch all’ that is only applicable to private parking tickets and can be applied in addition to another ground or alone if the fine is too harsh for the breach. The more grounds you have, the stronger your case. This questionnaire covers the general grounds for fighting a parking ticket and that you should look up the individual rules for each issuer for more detail. I parked in a Smart Parking car park. I paid and displayed on these two separate occasions. I have received parking charges! It is a private car park but I received PCNs x 2 ! £60 or if left £100 each and theyve said it was insufficient money paid. I sent appeal. I didn't have the parking ticket saved for the first one but I do have the parking ticket for the second one. I did pay both. They have sent back a letter to me saying they are upholding the charge... I have paid on both occasions. They say I mistyped a digit in the registration number. They have shown me what I have typed on both occasions proving I was at the machine and put my money in it.! The only ticket I have got as evidence shows I have typed a zero instead of an O... It should start EO and ive put E0... they said in the letter "it is your responsibility and the signs clearly state you have to type it in properly and correctly".. so they're fining me £60 each (the first ticket I had they say I typed in EO correctly but put a 0 as the 3rd digit so EO05 instead of EO55.) and fining me for that too. I acted immediately and so it will stay at £60 but I've got to appeal to popla and I have 28 days to do that ...BUT! !they have told me that the reduced fee of £60 will only stand for the next two weeks and it will expire BEFORE Popla appeal is completed so they have told me that if Popla turn me down I'll be liable for a full £200..!! Please can anybody please help/advise me.. it's going to cause me financial hardship .. £200 !! for two mistyped digits.. I paid and displayed in good faith but I've only got one of the tickets and I can see I have done a E055 and not EO55. Its making me ill as I have had a lot on lately. Will someone please help me as I am on my own. Im just worried about the lot of it. I paid in good faith. We received a penalty charge notice from UKCPS for parking in an industrial estate on double yellow lines, however we clearly displayed our disabled badge giving us 3 hours to park. Can we appeal this? Should we just ignore them? @Lizbeth - double yellow lines are double yellow lines and need no signs to explain. I parked in a double yellow lined drop of parking bay in a privately owned car park, it had no signage on the side of the road and the signage of the opposite side of the road is erected in bushes and would involve standing in the middle of the road to read. My son forgot his inhaler so I put my hazard lights on and quickly entered the cinema lobby to give it to him but I came out to find a traffic warden issuing a ticket. Should there be signage up near the drop of bays? In May 2016 I received a by UKPC for staggering a parking bay whilst dealing with an emergency for my mother who is disabled.I clearly had displayed her disabled badge. I wrote to appeal the ticket and received a decision by POPLA that my appeal was successful.Only later to find that I received a letter demanding payment which had increased from £60 to £100.I called and spoke to a lady called Nichola who advised me to pay and once I had located the letter with the appeals outcome (which I could not find at the time) then I should write a letter to the complaints department.I did so after finding the original outcome and I received no response to emails dated 12/7, 19/9 and 6/10.I then wrote a letter in November.At these points I could no longer get any answers by phone and so I resorted to written correspondence only.To date I have hit a brick wall, I have not received any replies to my emails or my letter.I want a refund of £100, what am I advised to do? It appears UKCPS are sending out a lot of £100 parking charge invoices, without affixing an initial parking charge notice to the windscreen of cars. The company is not following correct procedure. Surely this needs investigating by the Trading Standards in the area the company belongs. I received a letter from UKCPS stating I owe them £100 for a parking charge notice, which at the date of this notice remains unpaid. The parking charge notice was not affixed to my windscreen as stated in their letter so I only know of this now. It was issued on 28th May 2016. I rang to enquire if it could be reduced to its original charge of £60 but they said I had to appeal in writing and there's no guarantee that it will be reduced. I literally dropped something off and I was back in my car within 10 minutes. My friend lives on the fourth floor and parking is restricted to permit holders only. Can I appeal? Any advice would be greatly appreciated. Thanks in advance. I parked at a supermarket with a private car park signage. All I remember is you have 2half hours to park. I crossed the road with my disabled sister to give my daughter a key and proceeded back into the complex and did our shopping. On return to my car I had a parking ticket saying I was seen leaving the site and after writing to them saying what I did they said I entered into a contract by parking there and left the site so have to pay. I only left for 2 mins and came back to shop. Can you help me? If you have your receipt for the shopping you did on that day it should contain all the information including the date and the time of your shopping trip - this should help your appeal. I live in a gated community where the management company has decided to hire CPM to police the parking. I parked in my own allocated space but the permit slipped into the gap under wind screen which can't be seen clearly, I have now received a letter which asks me for a fine of £100(£60 if pay within 13days). Help! Should I write a letter saying I shan’t be paying because it is my own parking space? I reguistered with phone and pay on the 17/11/2015 , unknown to me I thought I was booked in for a parking session , the fact was my details and another were mixed upie phone numbers so we couldnt gain access I now have recieveda PCNto top it all the chap who was mixed up with my details was getting his parking paid withcard ,its took me over two weeks to find this out, the bank adviced me to cancel my card ,which I did, the phone number for phone and pay is 01727229225, been on to them several times for help ,as I think it wasun acceptable for someone to get thier parking on my debit card, I have drawn a blank and have no help from them about the PCN no 1878703596, can you give me any advice or help in this matter. You have to appeal directly to the company who gave you the ticket, otherwise you are going to get charged an excess. While recently attending a funeral, I inadvertantly parked in a restricted bay (within a private car park) - I only realised my mistake when I returned and found the ticket. Icomplained to the issuing security company, supplying official funeral documentation in support but to no avail. Makes me feel proud to be British. I was thinking about claiming via small claims court but after reading the help questionaire I doubt if I would win.